Payment Due: By 12:00 pm (Noon) on Tuesday, October 9, 2018. Forklift Loading Assistance: Loading will be available at auctioneers discretion, wait times may occur. Buyers are responsible for all aspects of removal. All items remaining after this specified time are considered abandoned and forfeited, with no further rights by the Buyer. Attention all professional cabinetry shops and woodworking hobbyist! Don't go against the grain on this sale because it's sure to hammer out some great deals! 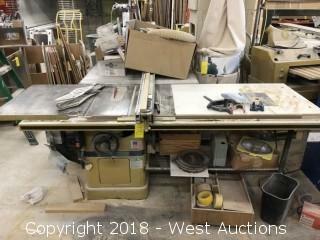 This online auction features a wide selection of woodworking tools for sale including an edgebander, sanders, table saws, planers, routers, power tools, and more. 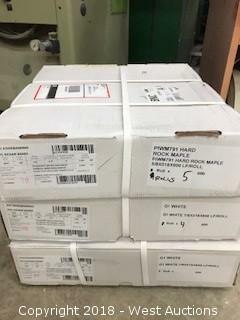 Don't let your next woodworking tool purchase be a splinter in your side - take advantage of this no reserve online auction in Northern California. Note: Certificate of Title, DMV Transfer Form will be mailed 2-3 weeks following close of auction. Vehicles passed smog, electronic verification from smog shop to DMV. Buyer is fully responsible for registration and fees due DMV. Note: The wooden box under the table is not included with this lot. Note: 10/1/18 1:32pm - This saw only comes with one fence. Machine is Hardwired to Switch Box. NOTE: Buyer is Responsible for Disconnecting Power from Machine. Compressor is Hardwired to Switch Box. NOTE: Buyer is Responsible for Disconnecting of Power. Note: 10/1/18 1:30 pm the fence was added to the lot and new photos were taken. Security Deposit: The buyer is responsible for all costs to repair any damages to the premises resulting from the removal of the equipment. A security deposit of $2,000.00 is required prior to removal and is refundable only after the landlord conducts a site visit and verifies that the buyer has not damaged the premises during removal. Duct to the roof is connected to the roof jack. 120 Volts is connected at the switch box. Buyer must disconnect. The disconnection point will be the last seam before exiting the roof line. Motor: Leeson C6T17FB65D 2 H.P. Page last refreshed Wed, Apr 24, 11:29pm PT.